feedback Archives - Delray Awning, Inc.
For three generations, we have achieved a reputation of dedication to quality and meeting the needs of our customers. The highest compliment you can give is in joyfully referring others to us that you feel we can help. Please remember how grateful we are when we receive these compliments on our work. You are allowing us to be of service to you. The following comments and testimonials are excerpts taken from actual letters from our customers. 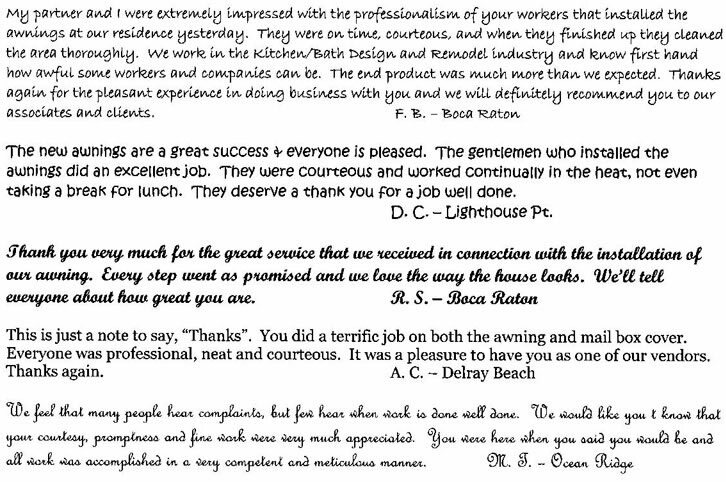 These letters and many others are available for inspection at our office located in Delray Beach, Florida.